Lofty texture and luxurious warmth coalesce in this gorgeously refined pinch pleated comforter. Soft and durable polyester is gentle against the skin, maintaining its color and depth for years to come. Was a little leery of buying a comforter online that I can't feel or see the true color but it would have had taken me forever to find this color with the pinched pleats. I have another comforter with these pinched pleats and they look very pretty but most of all keep the stuffing from shifting. No shifting. Love this shade of grey. The comforter completely ripped at the seam after one wash.
Love this comforter. The color is not really a chocolate, but a beautiful rich color. I bought this as a gift for my daughter. I bought the Cal King size and it fit her cal king bed perfectly. I ordered the brown comforter and when it arrived it looked like it was gray. I was concerned that I had received the wrong color, but when I took it into a room with different lighting, it was indeed brown. My daughter loves it and says it is very warm. 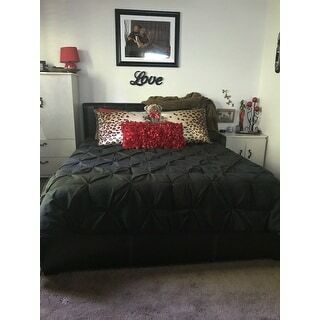 I purchased this comforter set when I redecorated my room recently. I originally purchased this in brown, but returned it because it was a dull, ashy almost tan color. I re-ordered it in black and absolutely love it, as it is a rich, deep, dark black. It is lightweight but keeps you REALLY warm. It almost feels like a thermal blanket, as it traps in body heat; so much so, that you may want to reserve this for the fall and winter seasons. Very soft and puffy. Comforter is warm and cozy. Pinch pleats look classy. Not sure how it will wash. Bought the king size for a queen bed, and it’s a great fit. This comforter is very well made and pretty, it's not heavy but keeps you warm. If your looking for a simple plain comforter with a little fluff this is the one for you. This is a very cute, very girly, tutu pink comforter... It was too pink for my needs and I had to return but if it was going in a little ballerinas room- it's perfect! Not overly impressed with the quality of this purchase, but it does look nice. The purple was a little lighter than I had hoped for, but it does the job! The design is lovely. But, the purple is not purple, it is lavender. I didn't want lavender so I am returning it. Looks beautiful - we love it. We ordered this comforter in Navy and it looks great and is super cozy. Looking forward to going to bed tonight! Love love these! Colors are awesome and a heavy curtain!! Love this! So comfy! Very nice color. Holds up well. Classy, yet sassy for the bedroom. Has just enough decor in the blanket that you don't need anything extra. Soft, but attracts ALL hair and lint. "Is this fabric shiny like a silky polyester or is it flat like bed sheets?" "I am not finding the actual measured demensions for King size?" The king size comforter measures approximately 104 inches x 92 inches.